On Thursday we successfully completed our first trial trail! We loaded up our packs, hit up the grocery store on the way out for some beef jerky and trail mix, and drove off to a local state park that offered a few trails ranging between 2 to 6 miles. When we first arrived at the state park we found loads of activities to do with the family outside of the trails that brought us there. They had amazing campsites that lined the river banks, multiple jungle gym areas for the kids, picnicking and pools of water for swimming. This will not be our last time visiting this state park! The backpack I was wearing originally belonged to my husband. 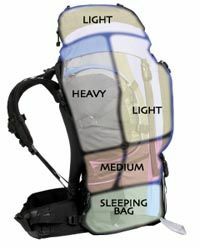 He bought a 75L bag a few years ago and I decided to save money by using his old pack since at the time the likelihood of backpacking together after the birth of our kids seemed so far away. I figured that I could make it work with a few strap adjustments. I was wrong. Immediately after putting on my pack I felt extreme muscle strain/pain at the base of my neck. My pack was not overly heavy, in fact, when holding it earlier it was lighter than I imagined. The bag was packed according to all the known guidelines to distribute the weight properly as well. I then jumped to the conclusion that if the weight was not the issue than it must be the fit. I enlisted my husband’s help to align the bag on me where it should land matching the straps accordingly. I never found a sweet spot, but did manage to find a bearable solution for the short trail planned. Let’s just say a new bag is on its way. Other than my own dilemma with my pack the 3 mile hike that we set off on went without a hitch. All the girls were comfortable with the weight in their packs and they wanted to add some items to their backpacks! One of the twins decided that she wanted to carry her and her sisters hammock while the other twin wanted to carry the books about flower and tree identification. We were happy to let them carry whatever they felt like they could, besides it helped lighten our own load! After we finished our hike we decided that we had all earned some relaxing down time. As you see above we hung up our three hammocks together! As the girls gently rocked in the hammocks we fiddled with all the tarps to try out different set ups that would work best for us. We only managed to get one tarp up before a massive thunderstorm came rolling in. The ranger approached us a few minutes before the first drop hit my head warning us of high winds and hail that were going to accompany this storm. This was our signal to pack up 3 kids and all the gear out as fast as we could. With our ponchos on we hiked the last 10 mins back to the car. We did not get to do everything we wanted to on this first trial trail, but we learned enough to gain confidence for the longer overnight trip! And at the end of the day your feet should be dirty, your hair messy and your eyes sparkling.